Soon enough, Dumbo the flying elephant becomes a national sensation, and this catches the eye of the greedy entrepreneur V.A. Vandevere (Michael Keaton), who schemes to take control of Medici’s Circus and, resultantly, Dumbo. 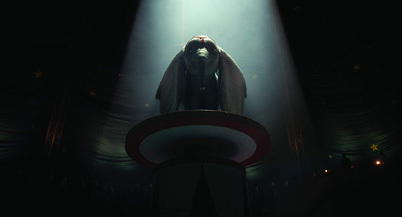 Vandevere also demands his French trapeze artist, the elegant and kind-hearted Colette Marchant (Eva Green), raise the bar of the show and ride Dumbo as he glides through the air, even if it means risking her life in the name of spectacle. It doesn’t take much brain power to predict where the rest of the story is headed, which, like the original, essentially boils down to a modest fable about the importance of family, loyalty, and expressing kindness and compassion to all creatures big and small. Though the humans occupy most of the screen time, Burton spends little time developing them beyond their roles in the plot and we never get a sense of who they are as people. This is especially true of DeVito’s Medici and Keaton’s Vandevere, who are painted as such one-note, over-the-top caricatures that it angers us Burton would let DeVito and Keaton’s inherent talents go to waste. The same can be said of Farrell, Parker, Hobbins, and Green, none of whom is given a chance to express themselves and become multi-dimensional. They exist just to peddle the plot rather than create meaning in what we’re watching, no matter how simple the overall message of the story may be. Then there’s Dumbo himself, who, just like his human counterparts, comes across as more of a checkbox than a fully realized character. His lack of depth is mirrored by the new movie’s ho-hum version of “Baby Mine,” which is painfully short, as well as the psychedelic “pink elephants” sequence, which was creepy and vibrant in the original but here gets so toned down and is made so nondescript that I wonder if younger viewers will even give it a second thought. The point of any filmic re-imagining is to create a new but hopefully just as good, if not better, experience, both for those unfamiliar with the original and those who simply want a different take on familiar material. What’s troubling about Burton’s “Dumbo” is that it does the opposite. I left it feeling as though my memories of the original were now tainted, because if I was to ever go back and watch it again, I would know in the back of my mind a paltry, unnecessary remake came out nearly 80 years later. It hurts to think about all the time, money and resources that went into this languid production. Burton and his team worked hard on it I’m sure, but they didn’t seem privy to what made their inspiration so special in the first place, namely that it had a heart and soul. They may have technically brought a live-action version of “Dumbo” to the big screen, but in doing so, they failed to bring it to life.